Hope Center provides free pregnancy tests, options counseling, limited ultrasounds, community referrals, and materials assistance through our pregnancy/parenting classes. 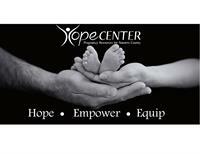 How You Can Support Hope Center. On the corner of 2nd and 21st directly across from Lott Physical Therapy.